Oh perfect joy!!! I'm back to beading again. And guess what? I'm back to solid beading. 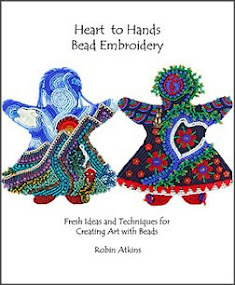 It's the way I started with bead embroidery. 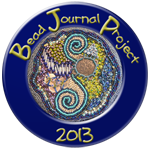 Then for the past 4 years of the Bead Journal Project, I've been playing around with mixing the fabrics and allowing them to show, even experimenting with beading on felt. 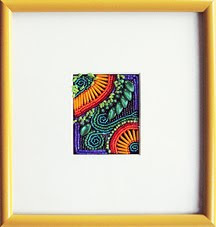 For this year's BJP, I'm making smaller pieces, 2.5 x 3.5 inches, the size of Artist Trading Cards. I don't think I'll be trading them though, as they are too personal and too much work compared to many ATCs I've seen. My theme is Blessings (like a gratitude list). As usual, I'm working improvisationally, with no plan, trying to "journal visually" about each blessing in the most spontaneous way I can. 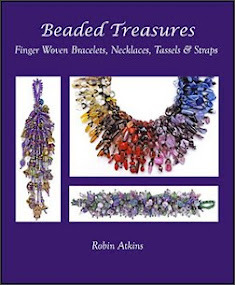 Due to writing my new book (The Complete Photo Guide to Beading) and eye surgeries, I am a half a year behind in the BJP program (which began in January), yet determined to complete all 12 pieces by the end of the year. I decided not to go back to January until later, as this month's blessing is so current and so important to me. 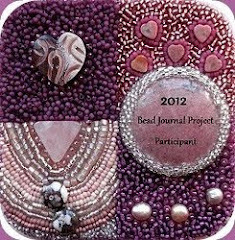 Below is my finished BJP for the month of June. I love the word "vision" because it has meaning on different levels. The obvious one for me (having just gone through two eye surgeries for cataracts with a hugely remarkable outcome) is the blessing of sight, of being able to see color, form, detail, depth, light... Perception of color saturation and detail were gradually lost to me as the cataracts grew and thickened. I am so very blessed to have good vision again. 1. Unusual competence in discernment or perception; intelligent foresight: a leader of vision. 3. A mental image produced by the imagination. 4. The mystical experience of seeing. All of these are blessings too! If you wish, you can find more about Vision in progress, here, and a post showing before and after cataract surgery pictures, here. My next piece will be for July and the blessing is Freedom, another word with multiple interpretations. I'm excited to get started on it. As you can see, the fabric is ready to go! 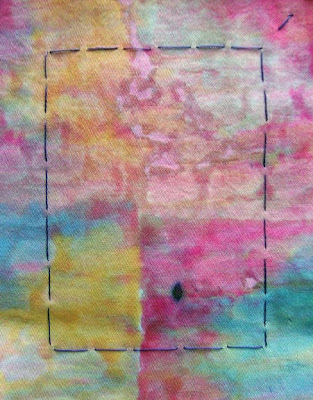 Already freedom is at play here, because I gave myself permission to cut a piece of hand-painted fabric that I made in Ann Johnston's workshop. You know how easy it is to hoard fabric like that, waiting for the "perfect" use? Super easy to hang onto it forever! Well, thanks to freedom - I cut into it! Yay! This piece is fabulous! I love the way you have expressed so much in such a small space. 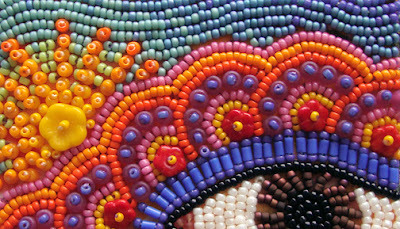 And the color and texture...stunning! Love this. Bright and cheery. And yes, vision is SO important! 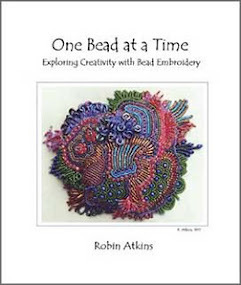 Hello Robin, I'm so happy to see you beading again, you are such an inspiration to me, thank you for that. It's so great that your surgeries were such a success, HOORAY!!! 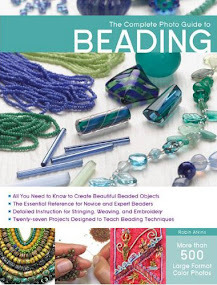 So, Happy Beading!!!! Can't wait to see what you do next. 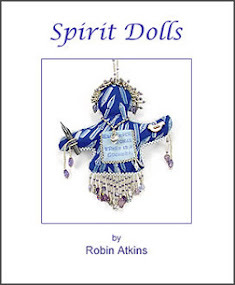 Oh Robin this piece is just fabulous, you're back in great form, it's really nice to see. Hugs. Absolutely gorgeous Robin. I like the flow of colour and the texture you have created here. I'm so glad to hear this! So glad you are back to doing some of what you love and seeing it really well, without the vaseline smear and lack of light. Your beautiful piece needs no words, the visual says it all. Beautiful. My 11 year old son came in while I was looking at your Vision piece. He said, "Wow, that is so beautiful. It's gorgeous." I love that he loves art! Thanks for sharing your work. Ah, Vision! 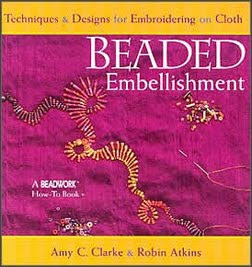 It terms of being able to see it has to be one of the most important things to those of us who like to stitch/bead/draw/create. i am always so grateful when the light is good but sometimes rather take for granted the fact that I can see even though my sight is ever more dependant up glasses/magnification. This ACT is beautiful. It reminds me of Rosie, perhaps because the colours are similar but more so because it is joyful and exhuberant. My hubby had cataract surgery, too, and was amazed by colors afterwards. He didn't know what he was missing until he had it back again. Sight is unspeakably important to me! I really love this BJP page. It's gorgeous. Your use of colors is fabulous. You always amaze me. There is so much to see in your work. It can't be taken in at one look. I am so glad you are back to beading. 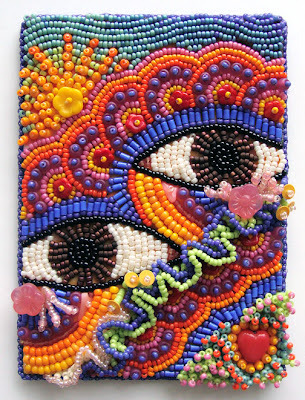 If eyes are the windows to the soul, then I can see yours in this piece! A lovely, joyeous piece that shows your great, big heart and open arms! What a glorious piece and such striking eyes! Eyes and BJP update - back to beading!